I wish to confirm your tea tastes great. My wife and myself are having a very good time with it. For just two weeks, I have lost 3 kg, from 88kg end Oct to 85kg as at this morning. The usual dreariness which comes over me in the office in the early afternoon which makes me lock my office and doze off for about 30 mins has already become history. The active ingredient in Jiaogulan is gypenosides. 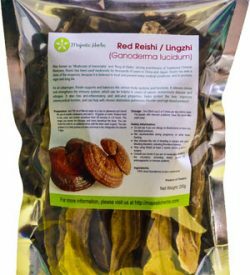 We have been using Jiaogulan gypenosides in our clinic for over 5 years and have seen amazing results in lowering high blood pressure and cholesterol. The results do vary from patient to patient, but 90% plus do have positive results. I have seen the systolic pressure lower from 10 points to 45 points and the diastolic lower from 5 to 30 points. I’m seeing phenomenal results in my patients with Jiaogulan gypenosides. I have several patients on them. The best story is a 74 – year old male who had bypass surgery and was on a few heart medications. I started him on 2 pills 3 times a day. Now he is taking 1 pill twice a day. His blood pressure is down to 120/72 and he is back working and extremely happy. Another patient, a 56-year old on Coumadin and 3 or 4 heart medications was having arrhythmia with a very irregular heart beat. He is now off all chemical medications, taking 1 pill 3 times a day. His arrhythmia is almost gone. I also had a young woman come in about 2 months ago with a lot of pain. It was a problem with a nerve. Bone had grown around her nerve. She was given different therapies to alleviate her pain, none of which worked. Out of desperation, I tried Jiaogulan Pills. Now she reports back that she is pain free. I was quite impressed. I have at least 8 persons who I am giving [Jiaogulan herbal pills] to. Seven of them are reporting an increase of energy. They feel it is stronger than ginseng. One person reports it decreases their anxiety. Two of them notice a significant improvement in digestion and bowel movement—one of them is my daughter. In another, it is keeping cholesterol and triglycerides down. Two of my patients, who are taking statins, are reporting muscle aches. There is great concern about statins now with the information about Baycol. lowering and maintaining their blood pressure. I started drinking jiaogulan 6 months ago because of a friend’s recommendation. I was skeptical because I’ve taken a number of different herbs and supplements in the past and never felt any tangible effects, but decided to give it a try anyway as my friend did seem to love it. I didn’t feel any different during the first week, but I did have more regular and bigger bowel movement than usual. The second week I noticed that I was getting involuntary erections at night, which was odd because this hadn’t happened in many years (I’m 38). In the following weeks I started noticing a subtle but tangible feeling of being more energized, yet calm and more focused. The stress at my engineering job was the same, but I felt it was affecting me less. I also started feeling less tired at the gym, and found I could lift heavier weights (or more reps for same weight) than I used to before. Another thing is that I usually have a cold sore outbreak once or twice per year, and it would last for at least a couple of weeks and would get pretty funky, which is extremely annoying and embarrassing. Not sure why, but since I started drinking jiaogulan I’ve been having more outbreaks – 3 in the past 6 months already, which is way more than usual. However, the cold sores would barely form, and would disappear within 2-3 days max, which has never happened before! I’m guessing this is because of the immune system boosting effect of the herb? Finally, before starting to drink jiaogulan I had a strange buldge on the lower right part of my abdomen. It would come and go (something to do with the intestines), and would usually form in the evening after a meal. Not sure what was causing it as I never went to have it checked by my doctor (it wasn’t painful and wasn’t really bothering me), but after about a couple of months of jiaogulan it completely disappeared and hasn’t been back.. I was hesitant to try the anti aging tea as I thought I wouldn’t like the taste, however I was pleasantly surprised as it is a great taste.. I used to drink one of the well known night cap drinks at bed time but found it didn’t help me to sleep as promised and was heavy in my stomach. I started taking jiaogulan for high blood pressure and high cholesterol. 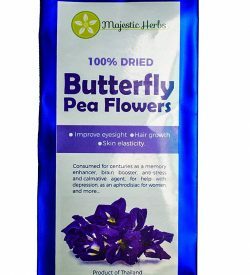 I have been using it for 4 years now without any side effects. During this time, I could cut out all blood pressure medicines and half the amount of atorvastatin to reduce cholesterol levels. It may even work on its own but on medical advice I kept a minimum amount of Western medicine. Matt M., 60yo. I’ve been taking this in tea for a number of years and as far as i know i’m healthy. I’m 31, male, don’t currently do much exercise, smoke, but look and feel fit and recently lost a stone, but probably through diet, not healthy but less food. Whether this herb works or not, if you are a true tea lover (that’s no milk no sugar), you’ll love this, particularly if you like green tea or sweet things (not that I’m suggesting green tea is sweet). It’s like a sweet tasting green tea, because that’s exactly what it is. I highly recommend. I have been using jiaogulan for over 10 years now, and i have found it very good. I used to have type 2 diabetes, and after using this herb every day, I have found my sugar to be less, and my diabetes has actually went away, and I am no longer a diabetic. I discovered this herb in China when I was living there. From visiting a Traditional chinese herbalist she told me about all of the Proven healing properties of this herb, At first it was hard to believe, until I visited some of the locals of ??? and heard their stories of how many people who had cancer actually drank this tea for many years, and were actually cured from their cancer. Many people who read this may not believe this at all, but i am really not asking any one to believe me, I am asking anyone who has Cancer, Diabetes, Weight Issues, High Blood pressure, to try this Herb in loose tea form, and you will experience the amazing benefits of this herb. Many doctors may not want anyone to believe the health benefits because having people take Toxic medication is a Billion dollar profit that corporations are making. Other than just my diabetes going away I also had Fibroid Tumours. 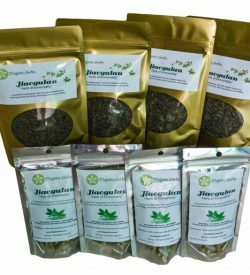 I consumed this tea for about two years at the time, and after the second year I went back to the doctors and the Fibroid Tumours were gone. It was so amazing to me. I could think of only one thing, The Jiaogulan herb helped them disappear. Or it could be from the anti cancer Green Tea I consume everyday. 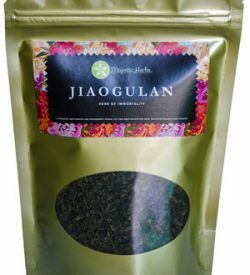 This tea is not as sorted as other Jiaogulan Teas I have bought in the past however it taste just as good and at about a third of the price I will only be buying Majestic Herbs brand. It is still organic and has 100g compared to about 30g in most other packages for around the same price. I have been drinking this type of tea everyday for a few months now and I must say I feel great. I have stopped drinking coffee all together and only drink this. I am now 62 years old . A long time ago I took ma huang as a diet pill and it took my blood pressure up above 200/102. I immediately took herbs to help reduce it and it came down , but never below 140/90. It fluctuated up and down a bit, but never returned to normal again , even with exercise and chiropractic treatments. 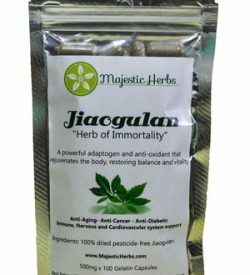 I’ve been taking Jiaogulan for six weeks now and really started feeling the effects about three weeks ago. I feel that I have more energy and deal better with stress but it’s not just that. For the first time in many years I simply feel like doing things. Trying new experiences, getting in touch with family and friends, completing half-completed projects. Amazing vitalising herb; immediate effect. My life long health problems have led me to research a wide variety of natural alternatives. I am on Adrenal Glandular (which I might need for the rest of my life). I get easily exhausted, and when I do my dopamine goes down and serotonin up (for genetic reasons). It was so difficult to find something that raises dopamine without raising serotonin. Jiaogulan does just that (in general; not just for me)! It also modulates immune activity, so it is helpful for autoimmune disease. Amazing plant, and I’ve only started to explore it. For the first time in three years I could go without the adrenal glandular and not get the adrenal crisis symptoms! The Blood Glucose decrease I have been able to test it in blood test and it worked. Most of its ‘beneficial’ effects beyond the diabetic effects come from inducing antioxidant enzymes and protecting cells from oxidative damage over time. There seems to be a motif where preloading and chronic loading is very protective at low doses, and acute supplementation or rehabilitation (taking the supplement after the stressor) appears to be less effective. As an avid coffee drinker, I was surprised by complex flavor and subtle but sustained increase in energy I felt throughout the day. This is the only tea I will drink. Btw, I brew the tea&store it cold& drink it instead of water. Billie T.